Today we cross the Atlantic in a non-stop flight from Cape Verde to Natal, Brazil. This will be our fourth Atlantic crossing in the last six months and my seventh crossing in N575PC overall. Crossing the Atlantic is never routine, but I am certainly more comfortable with the process now than the first time. Like most everything in aviation (and life for that matter), preparation combined with some experience make for a successful flight. 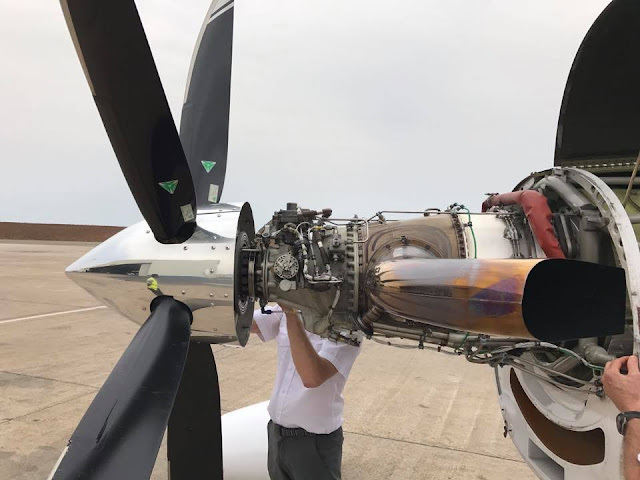 The day before the flight, we gave the whole plane a close inspection including decowling the engine for a close visual inspection. 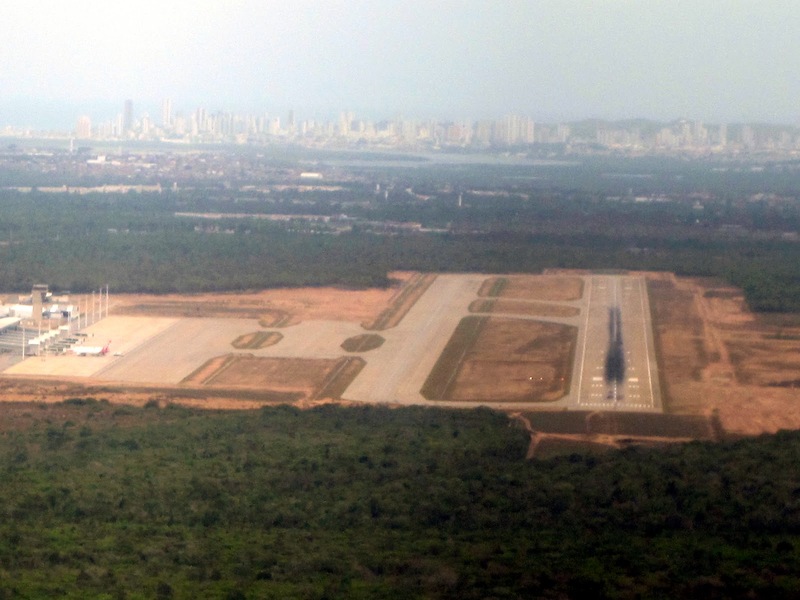 We arrived at the Praia airport around 0620 local time and after taking care of a few paperwork items, we had our clearance and were ready to taxi by 0725 local. Josh was flying right seat for this leg and Giuseppe made a video of the departure. At about FL080 (8,000 FT) we entered the clouds and were mainly IMC for the whole climb to FL300. A "perfect storm" of conditions made this a slow climb...we were very heavy, it was very hot (ISA+12 at FL300), and, because we were in potential icing conditions, we had to engage the engine anti-ice systems and climb no less than 130 KIAS which is 20 KIAS faster than our best rate of climb speed higher altitudes. We did not actually encounter any ice on the climb, but we always activate all the anti-ice systems and procedures when in potential icing conditions (visible moisture and < 10C OAT). While this is prudent, it robs climb performance due to the faster than optimum climb speed and the fact that the engine anti-ice system (an inertial separator) reduces maximum engine power. While it was a slow climb, we were able to go directly to FL300 without an intermediate level level-off to burn fuel and reduce weight. Shortly after leveling at FL300, we broke out into clear skies. The cloud tops were high, but we were above them by a small margin. Once at our cruise altitude of FL300, things were mainly smooth and clear. 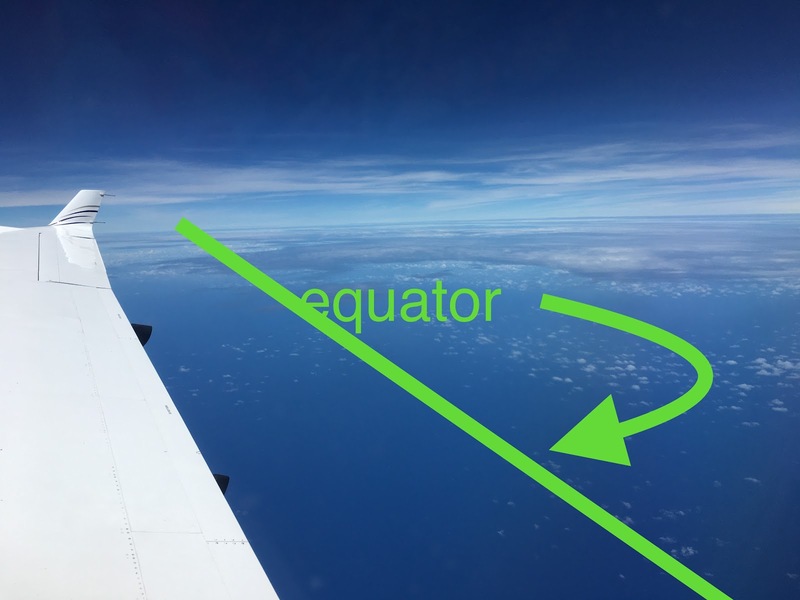 Because we were so close to the equator were the tropopause is very high ( can be higher than FL500) and non-convective cumulus clouds can extended much higher than back home. In Texas, if you see a vertically oriented cloud above FL250 it is almost always a thunderstorm to be avoided at all costs. Near the equator, there are often non-convective cumulus extending into the 30's that would likely be bumpy, but not especially dangerous. We made a few small deviations of a couple of miles to avoid the tops of some of these tall cumulus for the first hour of the flight, but then were on course with little turbulence until descending in Natal. The cruise portion of the flight was downright dull. We didn't hear a single other aircraft on Dakar or Atlantico frequencies until near the coast. Not even a SELCAL check. But, sometimes boring is good in aviation. We refined some of our oceanic procedures for this flight. Josh developed a great spreadsheet to calculate equal time points (ETPs) and points of safe return (PSRs) for both normal cruise and 12,000 FT. The ETPs tell your closest (in terms of time) diversion point. The PSRs tell you when it is no longer possible to return to a given airport. We calculate both these values for normal cruise in case we had to get on the ground quickly due to a medical emergency or something else not related to a problem with the aircraft. We also calculate these values at 12,000 FT in case we had a loss of pressurization and had to continue on to a suitable airport at relatively low altitudes where the plane is not as efficient and winds are likely different than cruise. Multiengine aircraft also calculate these values in case of an engine failure, but that isn't relevant in our case...we know pretty close where we will land if the engine quits (very unlikely)! While a water landing is very unlikely, we try to be as prepared as possible for that eventuality. While an engine failure on a single immediately comes to mind as a reason for a water landing, many multi-engine aircraft have ended-up in the water due to various problems such as running out of fuel (either caused by a rapid fuel leak or a gross miscalculation of fuel needed for a trip), smoke, fire, severe icing, or a pressurization failure that required descending to an altitude where the plane could not make it to an airport due to reduced fuel efficiency. An any event, in addition to proper emergency equipment in the planes (top quality raft, immersion suits, PLBs, etc. ), Giuseppe took on the task of mapping out where large ships would be along our route using a website that tracks ships enroute and can project their future positions. He picked out ships travelling rough parallel to our course and then input their projected position at our flight time into ForeFlight for easy reference. In the event of an extreme emergency, it would be a great tool. However, everything went well for the flight and none of the emergency procedures were needed. As we started our descent into Natal, we made minor deviations to avoid some bumpy looking clouds and landed in good weather. The paperwork in Brazil was fairly extensive and it took a while to get it all squared away. But, when finally done, the flight crew were happy campers and looking forward to a day off the next day in Natal. The next flying day will be a long two leg trip from Natal to Mar del Plata, Argentina with a fuel stop in Sao Paulo, Brazil. It will be around 10 hours of flying, so we are glad to have a day off for R&R beforehand.